Fall River, Mass., USA –Working closely with architect Mary Brewster and Evelyn Audet Lighting Design, Philips Lightolier has created a custom lighting solution for a Barrington, RI seaside cottage that not only maximized the commanding oceanfront view, but remained sensitive to the home owner’s energy goals. The renovation project, which is currently featured in a new series on Emmy® Award-winning home improvement series This Old House® , enlists local craftspeople and manufacturers to transform the dark 1926 cottage. In the lighting design, Philips Lightolier’s innovative Calculite 1.75” LED recessed lighting was featured, in conjunction with traditional lighting technologies such as halogen and fluorescent lighting. 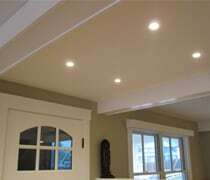 To further add to the ambience of the cottage and to the energy savings, the company added a dimming control that could easily be adjusted by the home owner. 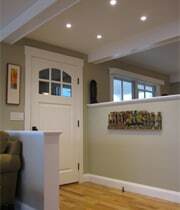 In the recessed lighting throughout the home, a number of insulated and non-insulated housing technologies were deployed to support the project’s energy and environmental impact goals. LED technology gives the consumer extended life, effectively requiring little maintenance for as much as ten years. The light control afforded by Calculite&apos;s fixture design approach serves to minimize inter-reflections of glass and capitalize on the view of Narragansett Bay. Advanced wall box dimming technologies from Philips gave the residents personal control to set the mood, as well as the ability to illuminate tasks while complimenting the natural light changes throughout the day. Known for its commercial downlighting, Philips Lightolier once again set the standard for innovation, quality and performance with the Calculite 1.75” aperture downlight. The Calculite provides consistent visual comfort, exceptional optical performance and mechanical precision. The combination of different aperture sizes and trim options, such as the adjustable slot, provided dynamic lighting effects that helped create a low glare environment with minimized fixture appearance in the ceiling. For more information about Philips Lightolier products, please visit www.lightolier.com. Royal Philips Electronics of the Netherlands (NYSE: PHG, AEX: PHI) is a diversified health and well-being company, focused on improving people’s lives through timely innovations. As a world leader in healthcare, lifestyle and lighting, Philips integrates technologies and design into people-centric solutions, based on fundamental customer insights and the brand promise of “sense and simplicity.” Headquartered in the Netherlands, Philips employs approximately 122,000 employees with sales and services in more than 100 countries worldwide. With sales of EUR 22.6 billion in 2011, the company is a market leader in cardiac care, acute care and home healthcare, energy efficient lighting solutions and new lighting applications, as well as lifestyle products for personal well-being and pleasure with strong leadership positions in male shaving and grooming, portable entertainment and oral healthcare. News from Philips is located at www.philips.com/newscenter..